Iran (MNN) – The largest group of Christians in Iran today have converted from another religion. In fact, Iran is the fastest growing church in the world, by some counts. That says something about the contagious nature of hope when you consider the fact that Iran is also one of the most dangerous places to be a Christian. 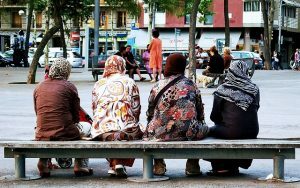 The World Watch List places Iran at number eight in a list of the worst places to live as a Christian citing extreme persecution at the hands of Islamic oppression. Heart4Iran exists to get the western world inspired and involved in what God is doing in this part of the world. And with globalization, specifically the movement of refugees from the Middle East into other parts of the world, there is a growing opportunity for the global Church to get involved in a very personal way right from home. Recognizing this, Heart4Iran developed a tool called “Reaching the Muslims Next Door”. This free downloadable guide shares practical ways you can reach out to your neighbors. They want to share that good news with Christians to motivate them into action. David says there are a couple of things to keep in mind when considering outreach to your Iranian neighbors. First of all, he says we have to remember that Muslims come from many cultures, backgrounds, and places. We cannot assume what’s true for one Muslim group is true for all. That said, he explains that often you will find Iranians are very willing to engage in conversation about spiritual things. But connecting with someone from a different background who doesn’t know Jesus should not be a one and done thing. David says in this case, the key is establishing a friendship. And then, you can talk about what you believe. And remember, there’s not going to be any convincing or tricking someone into believing what you believe. Heart4Iran has many additional resources to help you engage with the Muslim world so that they can learn about Jesus. You can check it all out on their website, here. In addition to their network, they also have several dozen partner ministries. So if there’s something specific in mind that they can’t help you with, they probably know of someone who can. Heart4Iran can also help you get a Farsi Bible if you have an Iranian neighbor. They also run a prayer and counseling service for any Muslim who is interested in knowing more about Jesus. For more information on these things, contact them, here. 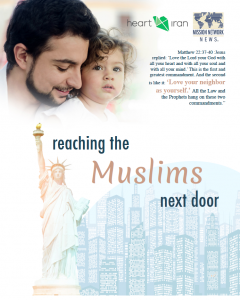 To access “Reaching the Muslim Next Door”, click here. And maybe you just feel led to pray about this situation. David asks that we pray for the American Church to realize this opportunity to tell others about Christ, and to take full advantage of it. Also, pray for the growth of the Church in Iran to continue and for God’s Gospel movement around the globe. David says their latest estimates are that four million people have come to Christ in Iran. Please continue to pray for them, as well.